How? Who knows. All I know is that my favourite season is fast approaching and I could not be more excited. Also, today means it’s officially one month away from our wedding, eek! Before I get into all things bridal, I am far more excited about incorporating some Autumnal makeup into my everyday picks. First up is the gorgeous new palette from The Body Shop – the quad in Smoky Plum is a neatly edited little collection of pinky purple shades that all perfectly complement each other. 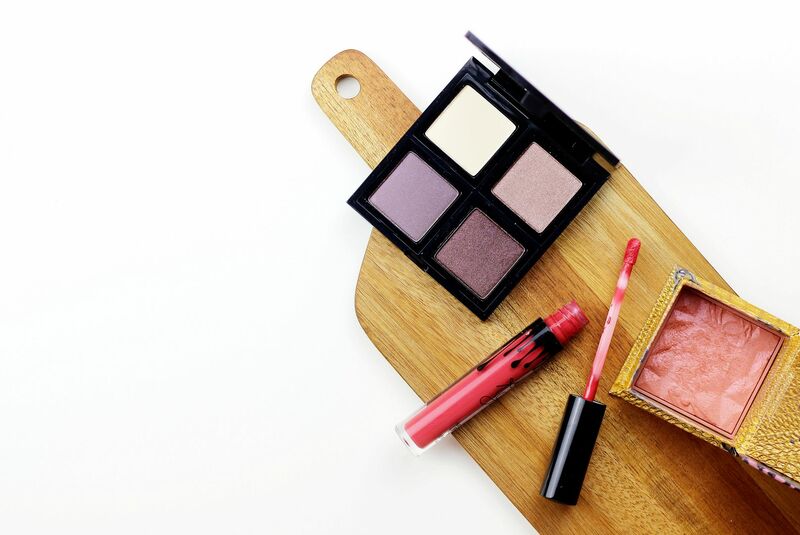 Autumn makeup is made so much better with plummy shadows – all things warm and jewel toned are OK in my book. You can mix and match the shadows in the other palettes to custom make your own selection as well, but I am more than happy with this purple mix. When it starts to get a little colder outside I don’t need much help in the flushed cheeks department, but I can’t resist the shimmery gorgeousness that is Benefit Rockateur. Rose gold blush, need I say anymore? Lastly, I couldn’t resist adding in this Kylie Lip Kit in Kristen K. The shade is everything. The most gorgeous red that is more neutral, if that makes any kind of sense! Not too bright or too deep but just the perfect colour to wear as we transition into Autumn. Perfection. Are you as excited about Autumn as me?